The Boston Celtics fell 123-112 to the Los Angeles Clippers, getting swept by both Los Angeles teams in a span of three days. After leading by as many as 28 points in the first half, Kyrie Irving went down with a knee sprain, and the train went off the rails. This was arguably the most embarrassing losses of the season, and a terrible way to end the week. After the young guys and the bench did much of the heavy lifting against the Lakers on Thursday, the veterans took on the challenge against the Clippers. Irving, Al Horford, and Marcus Morris scored the first 16 Boston points en route to an early 14-10 lead. The Kyrie/Horford two-man game was working particularly well, opening up a number of good looks. After the Clippers tied the game 14-14, the Celtics went on a 20-3 to get some early separation. Los Angeles was a part of a number of trades on deadline day, and after getting off to a good start you could see the lack of chemistry and inexperience playing together starting to show. Daniel Theis and Gordon Hayward came off the Boston bench and combined for three threes as a part of the run. Sooooo Theis is just up to 45.6 percent shooting from 3 on the year. The Celtics put up 43 points in the first quarter, and a large reason for that was their ability to get to the free throw line. Boston attempted 13 free throws and made 11 of them after getting into the penalty early and continuing to attack the lowly Clipper defense. LA also shot a miserable 24 percent from the field in the opening quarter. Hayward was a big time contributor off the bench to finish out the first quarter and start the second. He had 12 points on 3-4 shooting (5-6 from the charity stripe) in 10 minutes, and even tried his hand at dunking over somebody. Up until this point we haven't seen that type of aggression and confidence in his athleticism throughout the season. Now, granted, the dunk was blocked by Montrezl Harrell and wouldn't have counted even if it went in since it was after a whistle, but it could be a big development in his return to All-Star form if he starts attacking with more confidence. Gordon Hayward just tried to yam on a dude. Despite being up big for the entire half after a first quarter run, the Celtics were having trouble defending the pick-n-roll action. Harrell was the benefactor of a number of wide open dunks because the defensive communication was lacking. Boston finished the half with 74 points, their highest of any half this season, thanks in part to a balanced offensive attack (four players in double figures), and 40 combined points from the three point/free throw line. Things were going great for the Celtics all half, but some very unsettling news made its way out of the locker room as the game went into the halftime break. Irving, after heading down the tunnel with a bit of a limp, was ruled out for the remainder of the game with a right knee sprain. Definitely not something that the Celtics wanted to hear, and certainly something that put a damper on an otherwise impressive first half. The Clippers scored the first four points of the second half and Brad Stevens called himself a "Mad Brad" timeout. With a large lead and Irving out for the rest of the game, it would have been easy to pack it in and not play the right way. Stevens wanted to cut that thinking off immediately, and Morris and Terry Rozier, who started the second half in place of Kyrie, got those four points back in a hurry. But the Clippers kept coming, and eventually cut the lead down to nine with just under five minutes to play in the quarter. With Kyrie out, the offense stalled and ball movement turned into hero-ball isolation. Multiple Boston turnovers led to easy LA baskets in transition, and the C's were back to playing some ugly basketball. Celtics had just one turnover in the first half. They had three turns and missed 8 of their first 10 shots in the early going of the 3rd quarter... Clippers went from 28 down in the 2nd quarter to nine back with 4:40 left in the third. Boston scored just 12 points in their worst quarter of the season, while the Clippers seemingly got wide open layup after wide open layup. The Celtics went without a field goal for the final 4:17 of the third, and were on leading by five points heading into the fourth quarter. The Celtics were in for a battle, something that would have been laughable when looking at their 28-point lead in the first half. The Clippers were able to keep the game within a few possessions for most of the fourth thanks in large part to the hustle plays of Harrell and the shot making of Lou Williams. Landry Shamet, an asset that came to the Clippers from the Philadelphia 76ers in the Tobias Harris trade, hit back-to-back threes to tie the game 100-100 after a Doc Rivers timeout. A Shamet four-point play gave the Clippers a 4-point lead with just over three minutes to play, but Hayward answered back with a three of his own to cut the LA lead to one. But threes from Patrick Beverley and Danilo Gallinari and a Harrell dunk gave LA a 7-point lead with just 1:35 to play. 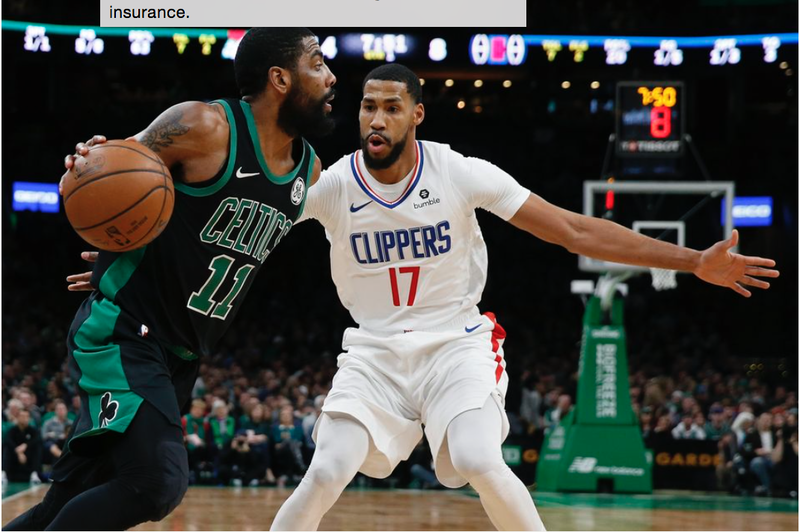 Jayson Tatum drained a three to cut the lead to four, but the Clippers, yes, the Clippers with seven new players, were too much to handle down the stretch. The Celtics will take the floor against the 76ers on national TV on Tuesday night looking to redeem this terrible performance.